In this episode, Canada issues a shortlist of suppliers for CF-18 replacement competition. The Canadian military is trying to decide how to handle marijuana legalization and a look at an interview with Andy Smith, Deputy Commissioner of the Canadian Coast Guard. The Government of Canada has released a list of eligible suppliers who would be invited to submit bids for the country’s future fighter aircraft fleet competition. The Royal Canadian Air Force plans to purchase a total of 88 advanced fighter jets. These jets will replace the current CF-18 aircraft fleet, which has been serving Canada for more than 30 years. The contract for the aircraft development program is expected to be awarded in 2021 or 2022. Gen Vance made these comments during an appearance before the Senate defence committee. 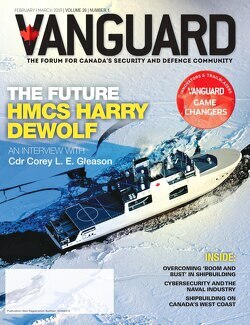 Vanguard recently conducted an interview with Andy Smith, Deputy Commissioner, Strategy and Shipbuilding, Canadian Coast Guard. In that interview, we asked him what are his top 3 short-term goals? Where he sees the future of shipbuilding for the Coast Guard given the average age of the fleet – can it be done within the service lives of the current fleet or do you see a reduction in fleet capability/capacity? If he sees a long-term fleet capital investment program similar to the Navy for the Coast Guard? Also, he touches on maintenance and life extension, success stories – CCGS Sir John Franklin and strategies and programs of the Canadian Coast Guard that he is really excited about. For the full interview, please go here.